Hi. Is it possible to update the results? i've seen it. some (most) of the matches barely looked like muay thai. there was very little use of knees, clinch and elbows. for the most part it looked like kickboxing. the guys started killing each other from round 1 no feeling out process. round 1 is typically scored 10-10 in muay thai and fighters use it to feel each other out. but there were a number of very good fighters. I think the lack of knees, clinch and elbows are due to the nature of how gyms are run here. We've got less sparring, ring exposure than say Thailand. Thus students don't really have a actual feel of how a real fight is going to be like. Also, how many gyms here teach students how to clinch properly? Decent pad work is already hard to find already less clinching training. 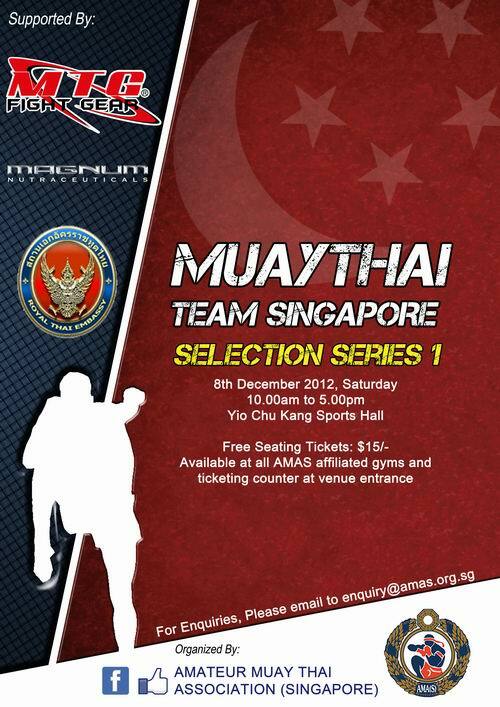 Muay thai standard in Singapore have a large room for improvement but its heartening to see AMAS stepping up their game with more invites and fights. Also, there are more gyms sending fighters. Keep it up and I'm sure the standard in Singapore will definitely improve! By the way, there SMU invite vol. 5 is coming up in 2nd March! 2nd March Muay Thai Tournament at SMU..... Any ideas? ?